Following long term downtrends in the value of oil, we’re finally starting to see relatively bullish activity out of the commodity. Now, the big question being asked is whether or not gains in the commodity will continue. In my opinion, the answer is no! Today, we’ll talk about why I don’t believe gains in the value of oil are likely to continue. Global Economic Conditions – In the United States, the economic conditions look pretty steady. However, when looking outside of the United States, a new picture starts to emerge. Unfortunately, some of the largest economies around the globe are struggling. This includes China, Europe, Japan, and several others. When economic conditions are poor, consumers look for ways to save money, and one of the best ways to do so is to reduce reliance on oil. As a result, demand for oil has fallen. Climbing Supply – Generally, when demand for oil is low, the countries that produce oil start to slow production to keep an even balance on supply and demand and support the price of the commodity. However, that’s not what’s happening this time. In fact, every time we turn around, the world seems to be producing more and more oil as each country continues to vie for a larger market share in the industry. As a result of the two primary issues above, we’ve reached a global supply glut, forcing the value of oil downward. Today, we’re starting to see gains in the value of oil as market conditions around the world start to improve. So, many are asking whether or not gains are here to stay. In my opinion, the answer is no, and for good reason. The reality is that market strength is likely to be short term. Investors are reacting to the massive losses we’ve seen in the market, causing values to climb. However, stocks can’t go up much higher, and neither can oil. The bottom line is that oil is still facing the same problems that caused the crisis in the first place. While market conditions seem to be improving for the time being, global economic conditions are still in shambles. In fact, hopes of stimulus out of China and Europe are what’s causing the improvements in the market and therefore, in oil today. However, even with stimulus, it’s going to take quite a bit of time for either one of these economies to improve. After all, China reduced its interest rate 6 times last year and Europe reduced its interest rate and extended quantitative easing in December. Neither one of these actions has caused positivity in either economy as of yet. The reality here is that it took a long time for economies to spiral out of control and oil supplies to reach crisis points, and it’s going to take quite some time for any solution to the problem to be effective. Where do you think oil is headed moving forward? Let us know your opinion in the comments below! 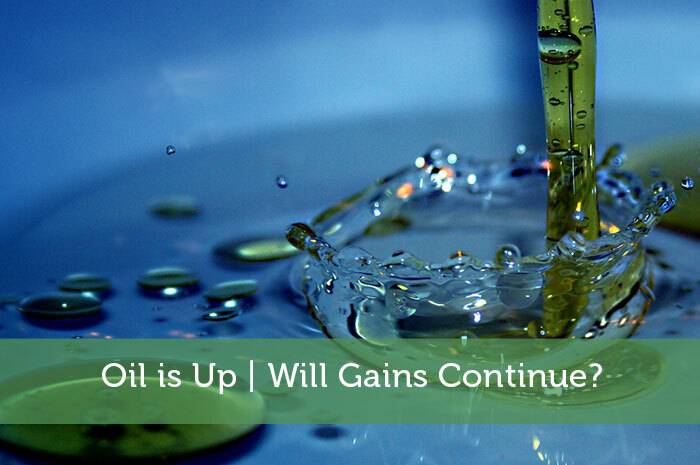 Oil is Up | Will Gains Continue? There will undoubtedly be a lot of short-term volatility in oil for the foreseeable future, but over the medium term it’s definitely headed back down towards $20 a barrel. We’ve seen ups and downs created by short covering, news, and fear, but the reality is just like you described: high supply met with low demand. There’s still money left in the short market for oil this year! Agree. Except I think the cold in the NE USA and the 1mln brl shortfall on heating oil compared to analyst estimates has also contributed to the spike up. Iran oil will come into play soon however, some shippers are in process of getting insurance and that will cause a temporary delay. We could see $34 oil before the next downtrend it seems. If the downtrend engages in oil before Wednesday this could dissuade the Fed from its next .25 uptick in rates. All eyes on 1/27/16.